The marble tablet commemorates the men of Oakwood and Cherry Tree Hill who died in service or were killed in action during World War One. There was a good attendance at the Oakwook public hall on Saturday afternoon, when, in remembrance of the boys who were killed in the war, additions were opened to the public hall there. 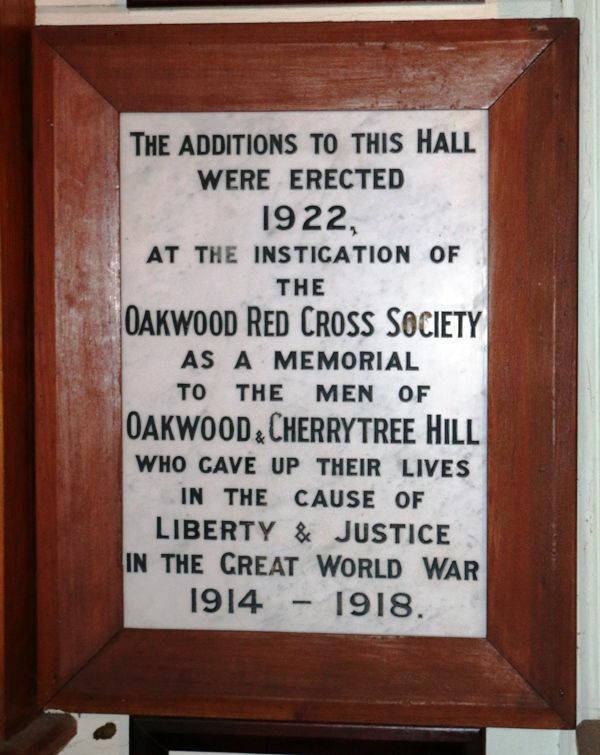 The event in permanently recorded in the modest marble tablet beside the district honor roll, in the following words: — The additions to this hall were erected in 1922 at the instigation of the Oakwood Red Cross Society to the men of Oakwood and Cherry Hill who their lives in the cause of liberty and justice in the great world war of 1914-18. The unveiling of the tablet was performed by Mrs. G. Palmer. This lady had four sons at the war, and two paid the supreme penalty. The Inverell Times (NSW), 3 October 1922.